Potter’s By The Sea Restaurant & Beach Bar – Anegada – This is a special dining experience! Dig your toes into the sand as you dine on the beach under the starlit evening sky. Known as the ‘drowned island’, Anegada’s highest elevation is only 28 ft. above sea level. 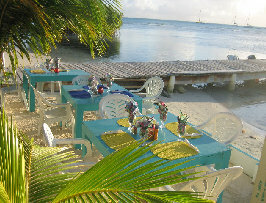 Anegada, British Virgin Islands, BVI, Restaturants. Bookmark.